This came to me in an email from my walking buddy. Most people have probably seen it, but it’s so delightful I wanted EVERYONE to have a chance. Categories: Small World | Tags: Bobby Darin, Buddy Holly, Eddie Fisher, Frankie Avalon, Peyton Place | Permalink. Why is it everything tastes better on Thanksgiving? Anyway, we went to Dad’s on Thursday, where we ate in the garage. We really aren’t that bad (most of us are very nearly house broken) but we usually eat out there when we’re at his house. The fact that there was thirty or forty of us and his kitchen area is fairly small and the dining area even smaller might have something to do with it. We visited with relatives, in-laws and outlaws and people we only see every year or so on Thanksgiving. Talk about a great time! The kids were a delight. The adults fun and entertaining. Someone told a joke on Thanksgiving. I’m still trying to figure out why anyone would name their shoulders. Late in the day, our niece and her husband came and brought their two. None of us can stay away from the sweet babies. They didn’t stay nearly long enough, but at least we got to spend a little time with them. Only one of my kiddos and his wife were able to make it for garage dining, so the next day, I got up and started baking and cooking for the other two boys and their women. Grandma Reeves Blue Ribbon Hot Rolls. Sadly, these wouldn’t have won a ribbon. Even when they were straight out of the oven, when I tested one to see if it would poison us (it didn’t) it didn’t taste the same as Grandma’s did back in the day. I’m not sure if it’s the yeast (Grandma used cake) or the locality (Grandma lived at Park Hill, near Tahlequah) or maybe the hands (Grandma made them for every get together) but they just weren’t quite right. Definitely, they needed more salt. I wonder where I can buy cake yeast? This is my dining room table. It’s not in the garage because our garage is full of cars and tools and silly stuff like that. It looks kind of empty in this picture, but when the food was ready, it got full really fast. I have a few turkeys that I set around at Thanksgiving to remind me of Mama. No, she wasn’t a turkey. (You really didn’t think that, did you?) She had a bunch of turkeys she set around to celebrate the season. In the picture above, I tried to make mine look like a real flock of goblers, but the best I could do was a drill team. 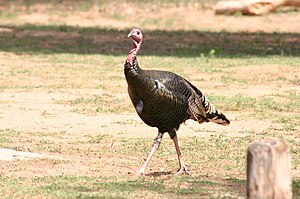 I consider this one the mama turkey because she’s the biggest. And white. But I think it’s really a tom. both days. And in case you’re wondering, Dad has the CLEANEST garage I’ve seen since we ate one year in Brother Jeffrey’s garage. Hope your Thanksgiving was as much fun as ours! Categories: Small World Family | Tags: Friday, Holidays, Home, Leftovers, Thanksgiving, Turkey, Wild Turkey | Permalink. That means this is, gulp, THE season. I’m not sure about you, but when they start counting the days until Christmas, I get a big knot in my stomach. Anyway (I know, back on topic!) it’s now the C-h-r-i-s-t-m-a-s season. So I thought I’d change my blog to a Christmasy look. *Sigh* Blog designers aren’t really into Christmas designs. I like being able to change the header picture, which is why I didn’t go with the only true Christmas design I found for WordPress. I’m doing good to be able to change the picture on top, so there’s no way I could design (or even redesign) one. When I thought about what picture I’d like to use in the header, I wanted something that would make me think of a true Christmas. The first Christmas. The picture I’d really like to put up there, I can only see in my mind’s eye. I want a picture of Mary holding Baby Jesus, and those are plentiful, but I want a picture of the way she really looked. Naturally, I went to the web. This one’s not too bad. But I didn’t find the one I wanted. One where the wonder Mary must have felt showed in her face. Imagine, knowing that God had put the Saviour of the World inside you for your body to nourish. Can you even begin to imagine how she felt, knowing the One who would be our redeemer was at her breast? Each time she fed him, each time she changed his diaper (did they have diapers?) she knew she was touching the Lord of Lords and King of Kings. I think she must have lived in a state of awe. Several years ago, Sister Debbie sang with two other women a song that was Mary talking about Baby Jesus. I not sure about the song or the tune. The third member of the trio was a girl about the age of Mary when Jesus was born. Although this girl was much prettier than Mary probably was, her coloring was close to what Mary’s would have been. (Beautiful skin tone, dark hair and eyes.) The words of that song sounded like what I would have been thinking if I were Mary. I think the song might have been Breath of Heaven. When I think of celebrating Christmas in the light of that song, my Seasonal Ulcer lets up just a little. Categories: Small World Christmas | Permalink. I love this video, especially the last part. Is it nature that makes animals (and most humans) love babies? Or God? I had a professor once who said, “Humans have no instincts.” He acted as if it were a fact, not just his opinion. Of course, I had to take exception to his remark. (I never have been very good at keeping my mouth shut.) As a mother, I knew God put an instinct in me. But when my babies were born, I adored them. When they were tiny, I couldn’t stand to have them away from me–even across the room. If my sister came, took my baby from my arms and moved to a different couch to hold him, I just naturally followed along, as if there was something that connected me to him. There was (and still is!) something that ties us together. Categories: Small World Blessings | Tags: Cat, Dog, God, Home, Kitten | Permalink. I know people who insist that everyone use their children’s proper names. Can’t be substituted or shortened, and I’ve never understood that. I’ve always had the feeling that if someone really likes me, they’ll have a nickname for me. And I nickname those I love. Maybe that’s because my dad nicknamed me Trudy Fair almost as soon as I was born. That wasn’t the first nickname in our family. When Dad was a boy, Uncle Jim’s girls called him Joey. He had another acquaintance who called him Hossfly. He never seemed to mind nicknames (can’t blame a man named Carol for adopting other names, can you?) so his kids never minded either. Trudy was about it for me, but Sister Debbie is called Bug. That’s short for Deedlebug, which was derived (I think) from her initials–DD. As Sister Cindy said in her comment once, she’s Tinny-WooWoo. Sometimes, Speedy Gonzolas. Sister Lisa is called #4 and Leeka Beth. (Phonetic spelling, guys!) Sometimes, like on the basket ball court or on a track, she was Greased Lightning. Right away after he was born, #4 named Brother Jeffrey. “Boy!” (After Mama had four girls, even #4 was impressed by the miniature male in our house.) Uncle Frank named Jeffrey Buck, and calls him that to this day. Amy answers to Amia Pizzaria. While our family came up with some pretty good names, I think UF (Uncle Frank) has a PHD in nicknaming. He passed out names and never forgets to use them. To Frank, I’m always Tuthan. (Debbie had trouble with S and he’s mimicking her 2 year old speech.) I always call Frank “Uncle Hank”–the way my oldest son pronounced his name. And I’m working on the name for our DIL2b. What do they call you when you’re at home? Four F’s for a HAPPY THANKSGIVING! It’s Thanksgiving Day (if I set this blog to publish at the right time.) BRING ON THE TURKEY! Food, Family, Friends and Fun! Of course, it’s much more fun if everybody pitches in to help cook and clean up, but you can’t always get what you want. I’m not positive everyone will be able to be with their friends and family, but I’m posting these cartoons, hoping to add to your fun. A man in Phoenix calls his son in New York the day before Thanksgiving and says,” I hate to ruin your day, but I have to tell you that your mother and I are divorcing; forty-five years of misery is enough. Frantic, the son calls his sister, who explodes on the phone. “Like heck they’re getting divorced,” she shouts, “I’ll take care of this,” She calls Phoenix immediately, and screams at her father, “You are NOT getting divorced. Don’t do a single thing until I get there. I’m calling my brother back, and we’ll both be there tomorrow. Until then, don’t do a thing, DO YOU HEAR ME?” and hangs up. Okay, maybe that last one is a little dark. But some people like dark meat. Right? Which ever you like best, dark meat or white, I hope you and yours have a beautiful, bountiful, boisterous Thanksgiving! Categories: Small World Blessings | Tags: Children and Youth, Christmas, Classroom, Fortune cookie, History, Holiday, Snoopy, Thanksgiving | Permalink.